I think we need to rethink this whole #TacoTuesday thing and instead try something like # My Taco Is Better Than Yours Bc It's Green. Or something like that. It's still in the developmental stages. In a large skillet over medium heat, heat oil. Add ginger and garlic and cook until fragrant, 2 minutes. Add ground pork and cook until no longer pink, 5 minutes. Add hoisin sauce and stir until combined. Add in the julienned red pepper and the spinach, and cook another 2 minutes. 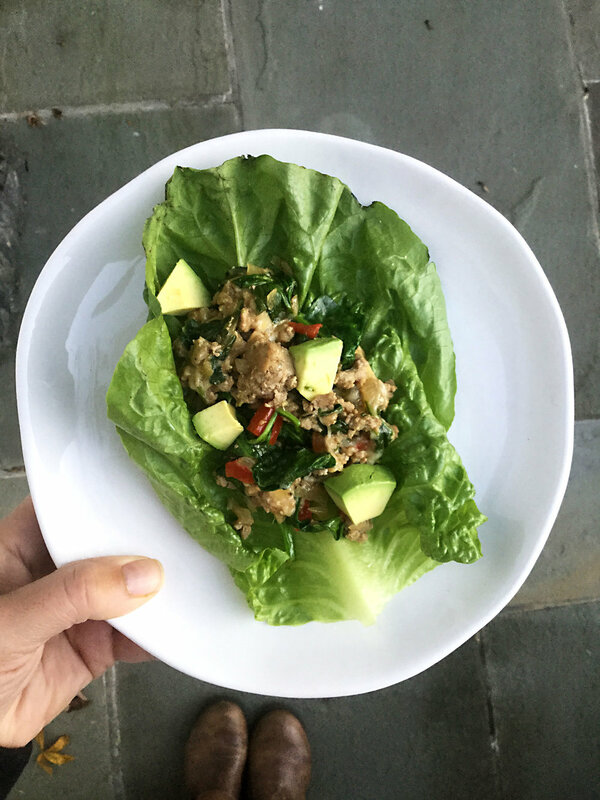 Spoon pork into lettuce leaves and sprinkle with scallions, avocado slices, and extra hoisin, if desired. And there you go, a super green taco! If you're looking to add more, go for it, there are plenty to choose from. Maybe even some pea sprouts, or chopped parsley or cilantro (both good detoxifiers!). You could even make a chimmichurri sauce and drizzle over. Yum yum nom nom!! #GreenTacoTuesday (There it is, that sounds muuuuuch better!) Any tips on how to go more green with it?! I'd love to hear, as my community can only grow by sharing! Let me hear what variations you use in the comments below! Newer PostThe BEST TASTING Chicken Salad!